Kitchen faucet, modern style, in chrome finish from the Moderno collection. This 2-handle faucet is made of solid brass and has a 1-function spray. It can be installed on a 3-hole sink. Faucet: Bring the functionality and rugged style of a professional kitchen into your home with the Kraus KPF 1612 Pull-Down Commercial Style Faucet.. Faucet body constructed from Low-Lead solid brass. New for 2014 Stainless Steel finish. Hi arc pull down spray with three function sprayer with 1.8 GPM stream, rinse spray and pause. 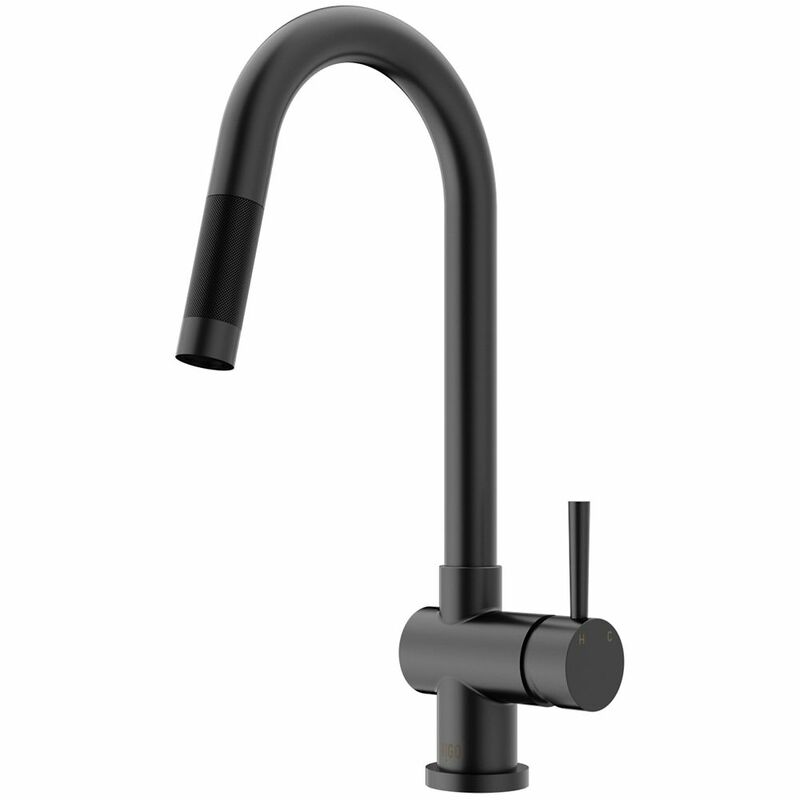 Gramercy Matte Black Pull-Down Kitchen Faucet is rated 4.3 out of 5 by 97. Rated 5 out of 5 by HomeDepotCustomer from First let me say that the packaging to this faucet... First let me say that the packaging to this faucet is above and beyond. I have spent far more on faucets and they arrive clinking around in a box unprotected. This is a fancy and sleek looking faucet. The only thing it's missing is a sprayer which I thought it had. Rated 5 out of 5 by Alexandria69 from Sleek design I bought my faucet a few months ago and it has now been installed and working for a month. I love it so far. The appearance of it was exactly what the picture on the site showed which is always helpful. It was easy to install and directions were clear. Rated 5 out of 5 by Angela from Looks great! Just had this installed in my new kitchen and it looks really sleek. Very heavy duty and high quality. Can’t wait to start using it! Rated 1 out of 5 by ericksse from This is a very nice looking faucet but it has a major decision flaw that renders it unusable. The... This is a very nice looking faucet but it has a major decision flaw that renders it unusable. The pull-down sprayer must be twisted into place on the spout (rather than locking magnetically). This twisting motion causes the black nylon water hose to kink which reduces or totally stops water flow. This faucet worked for only a few weeks before we encountered this problem. I've sent several emails and spoken to Vigo on the phone about this problem and I provided pictures of the kinked hose. They offered to send a replacement part, although I expressed my concern that this would happen again immediately. Vigo sent the wrong replacement part - gray hot and cold water hoses, rather than the black hose (I don't think the black hose can be replaced without disassembling the entire faucet and it would need to be done by a professional). Vigo has refused to refund my money. I've attached the picture of the black hose kinked in 2 places below. Rated 5 out of 5 by Mrs Magoon from Surprising surprised I never thought Id ever purchase a faucet online, but i wanted a black one and the big box stores did not carry them. After searching the internet I found the VIGO black faucet was exactly what I wanted and the price was excellent. I love it. And it looks great in my new kitchen. Get lots of compliments too. Rated 4 out of 5 by Leftylei from No sprayer I like the faucet but did not realize I was ordering one that didn’t have a sprayer which I miss.